Available for download, the Slate Digital FG-Stress is an emulation of a hardware compressor well regarded for its uses on drums, guitars, vocals, and other sources. In modeling the Empirical Labs Distressor, Slate Digital emulated every aspect of the hardware's circuit path to bring a faithful emulation. The circuit topology of the hardware unit is unconventional in that each ratio's behavior causes the compressor to behave differently, almost as though it were a different hardware piece. The software models these differences, giving you every ratio selection including the 10:1 Opto setting and the coveted Nuke mode found on the hardware. As such, the FG-Stress can sound like a VCA compressor, a tube-based compressor, and even an opto unit. Knobs are on hand for input, output, attack, and release. These controls are continuously variable. Beneath the knobs are your ratio selector, sidechain detector filters, and two options for adding subtle harmonic distortion to the signal. A mix knob lets you blend dry signal into the path, so you can achieve parallel compression techniques. 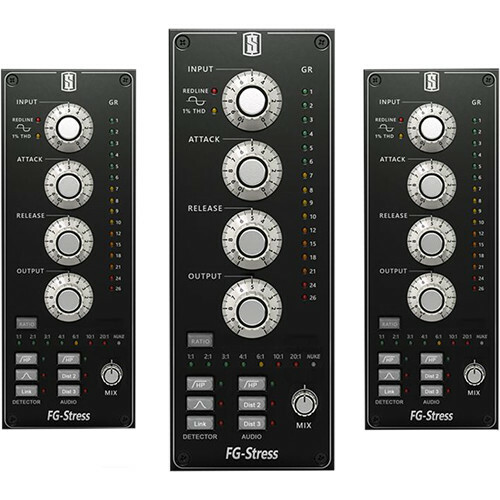 The FG-Stress operates within the VMR (Virtual Mix Rack) plug-in. When you want to use it in your DAW, simply instantiate the VMR plug-in, and you'll be able to access the FG-Stress, as well as any other VMR plug-ins for which you currently own or subscribe. These modules are Mac and Windows compatible. They can operate in VST, AU, and AAX formats. An iLok 2 or 3 is required to run them. Note: This product requires that you have an iLok 2 or an iLok 3. iLok is available separately.